Christmas is a wonderful opportunity to invite your family, friends, and neighbors to church as we celebrate the newborn King! 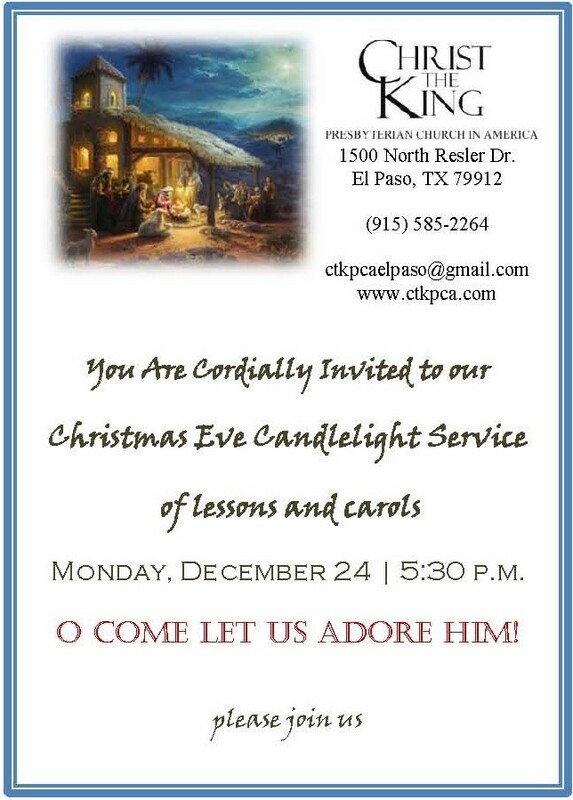 Whether you attend our services regularly, you've never ever been to Christ the King El Paso, or you fit somewhere in-between, we invite you to make plans to join us on Monday, December 24 at 5:30pm as we gather for our annual Christmas Eve Candlelight Service of Lessons and Carols. May this Christmas be blessed as you celebrate the wondrous miracle of the birth of our Savior! 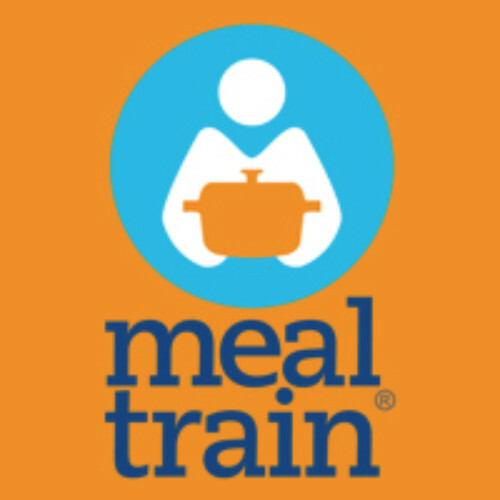 What is a meal train? There are times in our lives when friends and family ask, "What can I do to help out?" Oftentimes, the answer is to help them with a meal. When many friends give a meal, this is a Meal Train. Meal Train is a tangible way for the CTK congregation to help out this young family with a new baby. Meals can be brought warm or ready to warm up when they are able to eat. Celeste Cisneros is the contact person so if you have any questions you can email her or you can call the church office at 915.585.2264. Get on the Meal Train! 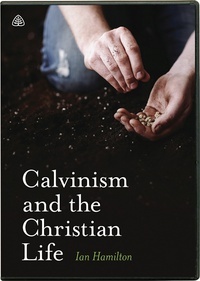 The video lecture on Calvinism and the Christian Life by Ian Hamilton will begin at 12:10pm after lunch with discussion following. PLEASE JOIN US! Contact David Fickett for more information. Do you have a prayer request that you'd like the CTK prayer team to pray for? Call Ella in the CTK office 585-2264 Monday-Thursday 9:00am-1:00pm or email your request to her. Be assured that every prayer request will be kept in the strictest confidence. If you'd like to join the CTK prayer team and will seriously commit to lifting up members of the CTK Family, contact Ella as outlined above and provide her with your name, phone number and email address. Prayer alerts will be sent out by email unless you specifically ask for a phone call. Prior to and immediately following worship we have coffee and snacks. Please come and enjoy a few minutes of fellowship with us. Nursery provided during worship for children ages 3 years and younger. Updated church directories are available by email at any time. If you would like one sent to you, please click here to email Ella or call the church office at 915.585.2264 to request yours. 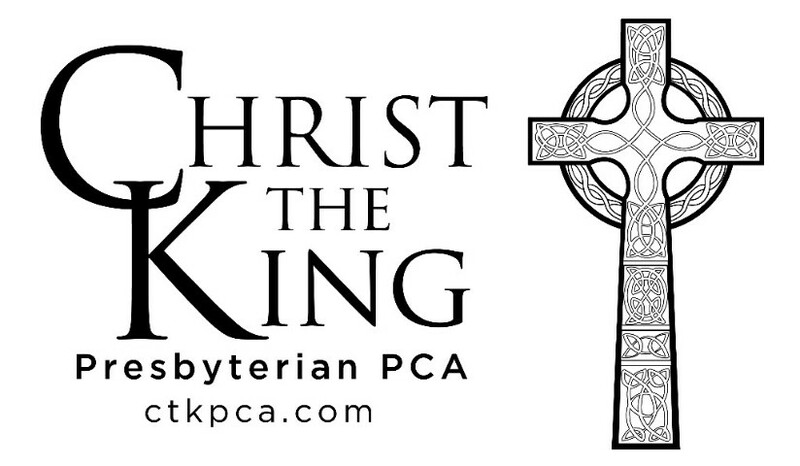 Wondering about Church Membership at Christ the King? Click here for information about joining CTK. Email Pastor Chuck if you would like to talk with him about becoming a member. CDs of each Sunday's sermon are available. Contact Ella in the church office at 915.585.2264 to request your copy. Make sure to let her know which date you are requesting. Copyright © 2018 Christ the King El Paso (PCA), All rights reserved.